In part 2 of this episode, we solicit the feedback of some of our listeners as we view Mormonism through the lens of Hassan’s BITE Model. Oh my gosh! Anyone who has not listened to the scrupulousity podcasts should go listen to them ASAP! They are my favorites. They have helped me understand myself and helped me to be at peace with my spirituality. Also, John Dehlin, are you doing more podcasts on scrupulosity? Because I would love that. 1. Wards are organized geographically and if you are in a ward that you feel is an unhealthy environment for you, you aren’t allowed to have your records moved to a different ward unless you actually move. 2. Early morning seminary is terrible for the health of teenagers. Research has shown that teenagers need more sleep than adults. I think this can apply to missions too. I’m the kind of person that I really need more than 8 hours of sleep, I always hated and struggled with seminary. I ended up not going my last year. Research has also shown that some people have more creative thinking patterns at night than in the mornings, so being a night person is a legitimate thing. Missions and seminary allow no flexibility for people who don’t fit the mold. If they feel the rigid nature of a mission would be detrimental to them. “Restrict leisure, entertainment, and vacation time.” From the time I was very young, I could feel the church’s pressure on families not to take weekend trips that might cause them to miss church or do anything on Sunday’s that cost money. That theme of going to church and going straight home and staying there was crucial in our ward. Another point that resonated with me is the example of keeping people in a child-like state. How many times have men been told to be strong leaders in their homes on the one hand but in the next sentence are told to listen to their bishops who will lead them on how they should accomplish this. Of course, there’s always the final authority, which is the SLC leaders who have the final say in how one’s own home should run. It has long struck me how Mormonism relies so heavily on Joseph Smith and his individual beliefs. Members and potential members are basically quizzed on whether he or she believes Joseph saw God and Jesus. Whether Joseph saw angels and deceased members of his family. Whether Joseph found ancient plates that he used to compose the BOM. If you say yes to these things, you no longer need to question whether God lives, Jesus is the Savior, or if there is an afterlife. By believing Joseph, all of these questions are definitively answered. No problem! But woe unto those who have hardened their hearts and decided to think for themselves. Hypnotic states? Probably the number one reason I dreaded General Conference (fake laughs right on cue was a close second) was the trained, hearsed, and rehearsed monotone oratories of every speaker. It bugged me to no end and I was recently reminded of it when I watched the LDS/NAACP joint announcement that featured a perfectly trained moderator narrating from the mic. I believe when you think about it tithing is regressive. I pay within $50.00 of 100% of my discretionary income to tithing. The percentage of a person’s income seems like an amount that is equal across the board, but when your income goes almost 100% to meeting your basic needs the portion of the discretionary income is much larger, thus the sacrifice much greater for families where expenses nearly equal income. Much of the criteria for being a cult comes down to protecting the “brand.” The distinguishing difference between organizational requirements and cultish requirements seems to lie in what is required when one is away from the group and on their own time and in their own homes. Hi John, Thank you for this guest and topic. I am still trying to transition out of the church while also going through a separation/divorce, a financial crisis, and learning about some disorders that I and my kids have. The one pertinent to this conversation is Asperger’s. Myself and my oldest have it. It has been enlightening and liberating and hugely frustrating to learn more about autism and how it has been a stumbling block for us. In church, we have always been aware of the illogical reasoning/explanations but we were just trying to fit in so hard. My son has been disciplined, bullied, coerced, shamed, all in the name of the gospel. He was bullied for about a year for having green hair one summer. The boys were callling him gay. While he knew gay wasn’t an insult, he was quite aware that it was intended to be. Or he was too loud, or too smarty-pants for the teacher/leader, wasn’t reverent enough, etc. He and my younger son have been left out of social activities because they were not invited. For myself, I just couldn’t do it. Relief Society was the worst. Everything was about kids, priesthood, service, and self-reliance. When I would struggle and ask for help, I was shamed for needing it. When I wanted to offer another perspective, I was treated as if I had openly sneered or denigrated everyone in the room, like my words were some kind of noxious gas being released on everyone. Aspies are desparate to fit in. It is close to an OCD compulsion. (Incidentally, so is correcting people which is just awful to do at church.) We are extremely literal and logical but find communication and rigidity very difficult to handle. Debating is quite a fun activity but hugely frowned upon. We can’t understand what we can’t analyze. Analyzing is the only way we process information. We always feel like we are doing everything wrong. To toss in moral shame or indignation for our analyzing on top feeds despair and makes it so much harder to socialize which is already so difficult. People with autism are especially susceptible to everything on the lists by Mr. Hassan. We are ridiculously easy to manipulate and shame. I wonder if you could do an episode as it relates to people from vulnerable groups – like those with autism, a disability, those living in poverty, basically those who are desperate. I loved listening to this. I downloaded one of his books right after and spent hours reading it and taking notes on any cult-like trait that I see in the Mormon church. I have pages of notes of things the church does that are what a cult does. I had never thought as the Mormon Church as a cult until now. The cult-like traits in the Mormon church are just more subtle than other cults, which in some ways is even more evil because they are harder to see and acknowledge. Just a few of the many cult-like traits our church has (he wan’t specifically referring to our church) that I learned about in this book are: Feel they are chosen people to lead humanity out of darkness, feel they have a special place in history, church gives them really high goals they can’t realistically achieve and make them repent when they don’t achieve, tell members how to dress and eat, leaders are always right, leader has unique knowledge of future, never a legitimate reason for leaving, bad things will happen if you leave, and the list goes on and on. One of the things I liked in this book is that he talks about how a cult doesn’t just apply to a church, it can be a relationship, family or group. I realized after I read this how important it is to teach our children that any person or organization that tries to exercise control over the way you think or your actions is dangerous. He also gives really good information on how to move on from a cult and what you can do to overcome triggers. I would definitely recommend his book, “Combating Cult Mind Control”. He’s doing some really important work! One day I’d like to join in as a panelist. It’s interesting how every organization in the world has these cult traits and practices… no is exempt. So its really pick your poison situation. The problem is a human culture and how much we allow us to make an impact. Awareness is key, that way we can take the necessary steps to avoid taking in too much of a good thing which can also become a vice. Being in an interfaith marriage (NTBM vs TBM situation) makes it difficult for me to join in as a panelist at the present. Mormonism, a cult? Only ‘true’ church. A Prophet who is sole authority to receive God’s revelations [in person] for every human on earth. Book of Mormon translated in the late 1820’s from gold plates that an angel took back to heaven for safekeeping. Sanitized history which includes polyandry, polygamy, discrimination against black Africans, sanctioned killings, misogyny, anti-gay policies, worldwide evangelical outreach, end of world doomsday Messianic policy. ‘Sacred’ temple rituals restricted to tithe paying adherents. Excommunication of dissident free thinking members. Army of apologists employed to refute historical contradictions and inconsistencies. Strengthening Church Members Committee that monitors and reports heretical public pronouncements made by members. Nah. That’s not a cult. Surely? 50. If you think Masonic rituals are a bastardized version of the ritual from the temple of Solomon, you just might be in a cult. 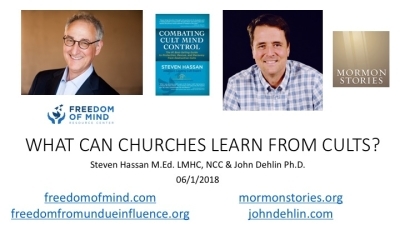 The subtle, destructive forms of control over all details of life, are easy to dismiss and/or disavow, partly because they’re baked into the LDS culture, rather than emanating in overt statements from the Ensign or Conference Center. And yet, they do emanate from the upper-stories of the Church structure. Destructive boundary violations and mind-control is very much an aspect of the belief structure of the Chuch, not anomalies that developed because the members are psychos who decided to create for themselves a CULTure, as some sort of curve-ball to what the leadership intended! No, the destructive aspects of being a member, ALL arise from a core aspect of the Church’s official doctrinal identity: the belief that the Church of Jesus Christ of Latter Day Saints is God’s one and only “true” church upon planet Earth, the only religion endorsed and authored by God. No matter how you try to slice and nuance your faith, no matter how the church’s public relations and public leadership tries to soften the meaning of that claim, in the end, it’s the one idea that rules everything else in the LDS church. You can’t set it aside and still have the same church. Every other claim, every other doctrinal and theological and programmatical aspect of the Church boils down ultimately to that One Ring belief, and ultimately, it trumps every possible kind of self-actualization. Every independent thought process will, eventually, bump up against this one idea/belief, and beg the question; is it true? Is the Church God’s church? Because, if so, then who am I to question any of the cards in God’s house of cards? This is the power-source for the many, many boundary violations the Church commits on members. The enforcer agent is fear. Not fear of overt retribution, but worse; the fear that haunts all humans-fear of the Dark. Fear of the unknown. Fear of uncertainty and death (literal and figurative). You can stand up to humans with staves and guns and angry rhetoric, but how do you stand up to your Creator? How do you nuance your way out of your own Salvation (and your family’s)? It’s easier to allow whatever independent thought that’s arisen in your mind, to loop inexorably back into the tangle of “The Church is True”, and escape the fear. This makes it look like a lot of the damage inflicted by membership, is self-inflicted. Culture-inflicted. Unnecessary. But, until the Church as an entity sets down the weapon of Ultimate Truth and Authority, the real truth is that it operates very much in concordance with Hassan’s BITE model.